Almost a couple of months ago I found a fabulous sofa on Craig's List. 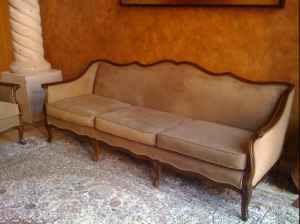 I look on Craig's List quite often and had been looking for an older sofa with wood trim. I found plenty, but they were usually too expensive or way to beat up to want to purchase. On this day in early April I logged on to Craig's List and found the set of my dreams. It had only been listed 10 minutes earlier, so I felt it was just meant to be. This beauty came with a matching chair too! Later that day and with only $340.00 spent, the set had found it's new home. 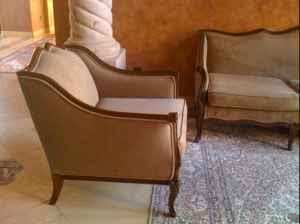 I will be reupholstering these and possibly refinishing the wood as well. I would like to change the cushion on the sofa from three separate cushions to one long cushion. They originally had tufted backs and nail head trim, so I will probably restore them to with the character they were meant to have. I'm searching for a linen fabric for the project, but haven't made any final decisions. Here are a few pictures of my Craig's List lovelies. What a beautiful couch and chair. I love the lines. Will you do the upholstering yourself? I envy you that talent. I have a rocking chair I'll redo, but that is simple compared to your job. Can't wait to see it when it's done. Amazing CL find's. You must live in a large metro area to have plenty to chose from. Can't wait to see them finished! Hi Pat and Lamp Tramp! Pat, I won't be reupholstering these myself, although I will most likely be taking an upholstery class through our local community college system that starts in the fall. These are just too beautiful to risk messing up. I most likely will redo in linen and that is too expensive to not know what I am doing. Lamp Tramp, I live in the Phoenix metro area and there is so much to choose from. The question is usually how far am I willing to drive to get something as our valley is pretty spead out. Keep reading ladies, I hope I won't disappoint! Those will turn out wonderful! You have a new follower!! Don't you just love when a new face pops up?? You will do great on your blog! I am really enjoying mine. Won't be home much the next few weeks to post much but will get back to it later this month! Thanks for stopping by my blog!